Air Peace Limited yesterday announced the acquisition of two Boeing 777 aircraft as part of its new expansion programme into the international market in 2018. The acquisition of the two Boeing 777 brings the number of the airline’s fleet to 24, making it the largest in the country. Its Chairman/Chief Executive Officer, Mr. Allen Onyema, who stated this in Lagos, said the two Boeing 777, when eventually delivered, would facilitate the commencement of flight operations in 2018 to Dubai (UAE), Guangzhou (China), London (UK), Houston (USA), Mumbai (India) and Johannesburg (South Africa). 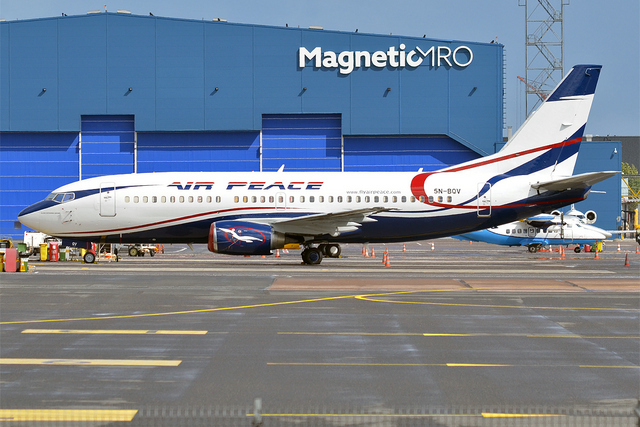 Onyema said he was satisfied that Air Peace was able to expand its fleet to 24 aircraft despite the economic downturn the country and its aviation sector experienced in 2017. He said the next challenge for 2018 was implementing the airline’s plan to deepen air connectivity on many routes in northern Nigeria, including Kano and Yola, and its other regional and African routes. “We pledge to end the air travel woes of most underserved destinations in Nigeria and the West Coast of Africa and offer the flying public a preferred alternative on some key international routes in 2018,” he added. He regretted that industrial unrest by Air Traffic Control in Senegal compelled Air Peace to suspend the launch of its Freetown, Banjul and Dakar routes planned for December 15, 2017. Onyema, however, assured that the carrier would soon announce a new date for the launch of the three suspended West Coast routes. Commenting on the carrier’s operations in the out gone year (2017), Onyema said the airline deserved commendations for stepping in at the right time and rescuing the Nigerian aviation industry given the size of its aircraft fleet and the many routes it was flying to at a time other airlines were experiencing a downturn. Air Peace, he assured, would continue to strive to sustain its uncompromising approach to safety, prioritisation of the comfort of its customers and job creation. He however attributed the airline’s success in the three years of its existence to the unflinching support of the flying public and the quality leadership of its management team. Aturu Julius, also known as AJulius, was born and raised in the Osun State, Nigeria. He studied Business Management, award winning publisher and business writer. He worked as a book reviewer for young adult, also a writer. He lives in Lagos, Nigeria and his love for crunching numbers, currency is shocking.